ASM will enable your company to align, track, manage, and account for decentralized teams collaborating on a variety of programs and projects. Customize your programs and projects to fit your business objectives. Gain insight into how your programs and projects cascade down from top level strategic objectives. Prioritize your programs & projects to align with the organizational business strategy. Look from the top-down to ensure your teams are working on the right things, at the right time. Understand who is doing what and how that strategically aligns work to meet organizational business goals. ISM enables you to make decisions with confidence. Many features such as Gantt charts, risks, deliverables, phase status, heat maps and custom dashboards allow for company wide visibility and expeditious reporting. Organizing projects around user specified project types allows for customization of information specific to the needs of each organization or project. Executives and managers can select, plan, manage and track a portfolio’s lifecycle from idea to execution. 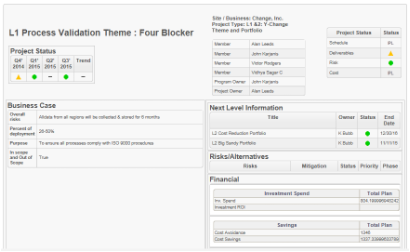 The rules engine allows for quick phase gate approvals, emails, and prioritizing of projects for selection or re-sizing. An organization can easily view the metrics of their portfolio, as well as (what) the objectives and initiatives they are supporting.